Home / BLF Live / BLF 2017 Reports / Lanka’s Princess, Vamp or Winner? “Without Shurpanakha, there would be no Ramayana, don’t you think?” asked Kavita Kane. “There wouldn’t have been a war if Shurpanakha hadn’t met Ram and Lakshman in the forest. She’s the main trigger of the entire series of events in Ramayana. Yet, there is so little we know about her!” lamented Kavitha. 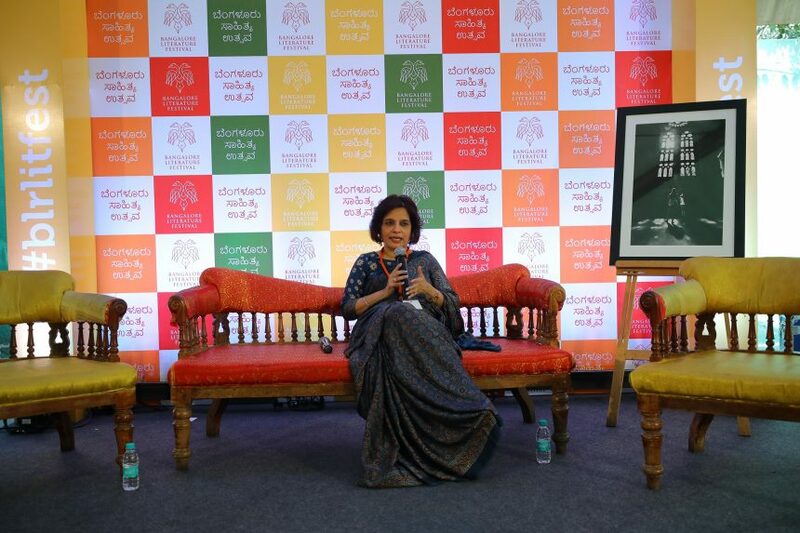 The female novelist, who recreated the entire story of Ramayana keeping Shurpanakha as the main character and the focus of all the attention, attended the final day of Bangalore Literature Festival and shared some of her thoughts on the character as well as the book. The author spoke about her purpose and motivation behind choosing Shurpanakha as the focal point of this epic. The author believes that, if we see Shurpanakha as a vamp then we would judge her in a negative way. “Why do we have to do that?” she asks. If we start seeing her as a victim, somebody who suffered from extreme physical violence, then the paradigm shifts in favour of her. When we change perspectives, Shurpanakha becomes an entirely different person. Breaking the stereotype is the key, mentions Kavitha. We have a choice of not always imagining Shurpanakha as a negative character by simply justifying her motivations and subsequent actions. Attraction is a human phenomenon and we, as considerate people, can make way for that phenomenon and simply accept that Shurpanakha was attracted to Ram. There should not be anything so wrong, that her nose had to be cut-off. Of course, Lakshman cut her nose when she tried to attack Sita. But the author maintained that, though Shurpanakha did make a mistake, in reality, it is very common for any human to make such a mistake. If the characters portrayed in mythology are shown with all of their traits and if all shades of their personalities are shown, then it is much easier to forgive Shurpanakha for what mistakes she had committed and the world as it is today – filled with eternal prejudice, bias and discrimination against a woman who had committed a simple human error – is something the author wishes to change. Kavitha goes on to elaborate that, evil has no gender and no colour. Darkness cannot be stereotyped into evil and fairness cannot be stereotyped into the divine. In the same light, the mere name Shurpanakha should not be stereotyped into something pure evil. Breaking perceptions and getting rid of norms and stereotypes is all this book is about, said Kavitha. The author went on to say that, even though Shurpanakha is a fictional character, we can still draw parallels with real life. But for the audience to believe in a work of fiction, the author cannot simply use her figment of imagination and create a character so different that the audience cannot relate to. The author indeed has to research and the portrayal of any fictional character is made, to a lot of extents, to fit the societal expectations of the reader. Balancing facts with fiction is the true challenge when it comes to writing mythology inspired novels, she concluded. About the Author: Soumik Seth is an avid follower of music, current affairs, stock market, economy, and filmography. He currently writes for Bookstalkist.